Download sytemd package from Arch page https://www.archlinux.org/packages/core/i686/systemd/, then click to extract and copy missing library to /usr/lib. This Os does not have full systemd package, just udev and two more libraries from original Arch package, but what actually is udev, is named as systemd to not break pacman compatibility. It will be interesting to know what functions you created dynamic menus for? Thanks in advance for your reply, and bye for now. Every time you right click to start pekwm menu, this scans through list of applications and shows them without need to type fixmenus inside terminal like currently in Puppy JWM. 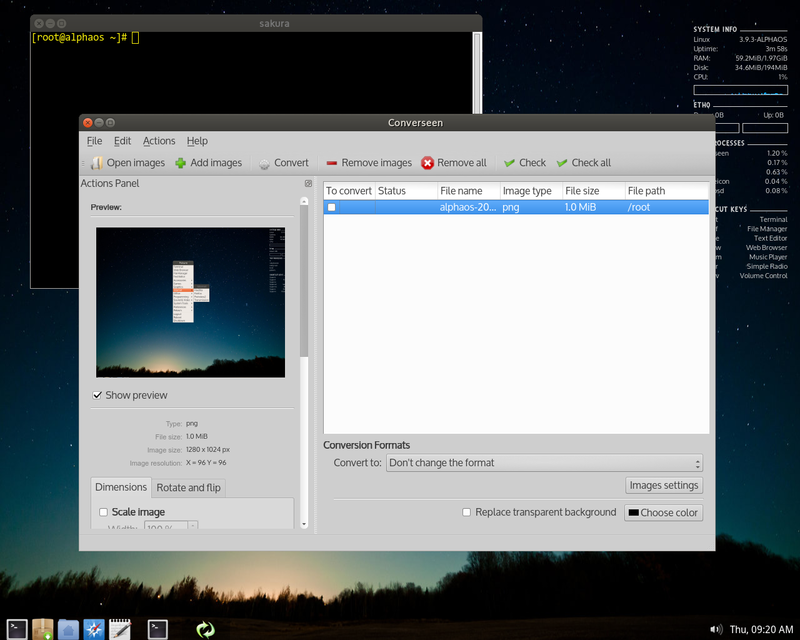 Program is modified to compile with gtk3, I'm using gtk 3.9.0, that ensures it will not become obsolete any time soon. Still no luck with your image... It is blown up when I click on it, but the image of the menu is still 1/12 of reality, because there are so many other things in the image, and it is an image in an image. It is certainly well done (you are known for quality of work). pmusic is for Audio only. Why the double category? But that is what you are supposed to do for categories for those programs. Also the standards do not have a "File Management" category per se, this is under "Utilities". Now the user needs this "File Management" as a top category to not feel lost. I am not sure the concept of constantly updating menus is very useful. When does the menu need to change? Mostly at the beginning, when the user fills up the Puppy distro with his/her favorite applications. After that, the need for updating is rare. I prefer the following solution, which was discovered by Mark Ulrich a few years ago in his Muppy 8.4, I believe, and which I have re-implemented: have the updating capacity, but use it only when the size in kilobytes of /usr/share/applications changes. Otherwise, when the update is automatic, there is always a "hiccup", a little slow-down, when one calls the menu (on older machines at least). Also, updating the menu when nothing has changed always takes some unnecessary processing time/cycles away from the CPU. 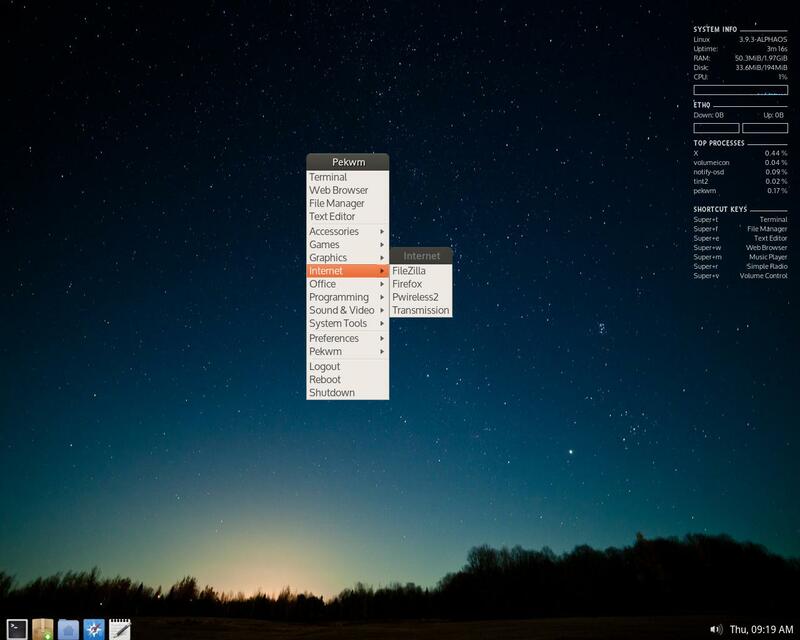 When you install lxpanel or xfce4-panel for example and click on start menu icon, exactly same thing happens like with this dynamic menu for pekwm, and that is how menu is generated in all other Linux distributions except in Puppy, whatever they target older or newer computers, doesn't matter. I don't find it is very CPU intensive, at least for me menu is instantly generated, but then I have just 32 desktop files under /usr/share/applications, in Puppy with 200 items might be slower. In my opinion it is useful when you install a program with pacman to have that application shown in the menu instantly, and not call some background script like fixmenus, that also don't forget is using equal or more CPU resources. Regarding menu categories, desktop menu specification exist with that purpose to stop everyone inventing their own rules, different just to be different, fragmenting and complicating things that should remain simple, example Games category renamed to Fun in Puppy Linux. If every other distribution follow desktop menu specification, why not Puppy? After all desktop files for applications are made to follow standards, so what's next idea in Puppy - make new background script that edits all of desktop files for thousands of existing applications. When you install lxpanel or xfce4-panel for example and click on start menu icon, exactly same thing happens like with this dynamic menu for pekwm, and that is how menu is generated in all other Linux distributions except in Puppy, whatever they target older or newer computers, doesn't matter. I don't find it is very CPU intensive, at least for me menu is instantly generated, but then I have just 32 desktop files under /usr/share/applications, in Puppy with 200 items might be slower. In my opinion it is useful when you install a program with pacman to have that application shown in the menu instantly, and not call some background script like fixmenus, that also don't forget is using equal or more CPU resources. Regarding menu categories, desktop menu specification exist with that purpose to stop everyone inventing their own rules, different just to be different, fragmenting and complicating things that should remain simple, example Games category renamed to Fun in Puppy Linux. If every other distribution follow desktop menu specification, why not Puppy? I'll agree with the standards and be a good sheep. But that does not appear to be the case. From the outside, these standards look like a prime example of committee-driven thinking: "Oh, we have to be careful, because Mr. So-and-So's feelings are going to be hurt -- or Ms. XYZ is very powerful -- or Careful, Mr. A from big distribution B will impose his own way independently if we don't include his suggestions", or whatever extrinsic argument. Maybe they were not committee-driven, but they look like they were -- there are too many exceptions in them. The first html page of the standards is logical. The rest, well, not so much. Even so, the first page lacks a prominent FileManagement category. Because the standard exists, it does not mean that they are really logical. If you've read them, you know that they contain many unnecessary complications. You can, for example, have a menu that uses categories based on KDE or GNOME only, which do not mean anything outside KDE or GNOME --- and the user remains very confused. The user, not you, not me: the user. After all, desktop files for applications are made to follow standards, so what's next idea in Puppy - make new background script that edits all of desktop files for thousands of existing applications. Why not? This is not a joke, and I'll tell you why. Have you taken the time to read the "Categories=" line in the *.desktop files in /usr/share/applications, one by one? I have, and it's a pity: it's chaos. I've already come up with a script to standardize the *.desktop files to at least respect page 1 of the standards. We shouldn't have to write this sort of script, but it is simpler than to re-train all programmers on how to write a decent *.desktop file. BTW, some of those programmers are Puppy-ists, but most are not... So nobody is an angel in this respect. At least one good thing about Mr. Kauler's *.desktop files : they always contain a utf line and a version line. Those prevent the parser from interpreting the international characters as commands sometimes. Not all programmers include that information in their *.desktop files, and those badly written *.desktop files can be a real nuisance in any menu. Let's conform to the standards, I'm all for it, but hey! first we have to have logical standards! Puppy is going its own way in this field of menus, but maybe there's a reason -- until the menu standards themselves are really compellingly logical. And we have not even begun to ask users what is the most intuitive menu for them! Ah! Find me a couple of good reports about that! The argument that "everybody else is doing it, why don't you?" is the argument of the sheep, I mean the argument of "think less, follow more". Distrowatch has 300+ Linux distributions on their site. Leave aside fact that many of those simply are not real distributions, ALL of them are following menu specifications, so 99.7% of distributions are stupid sheep and follow standard and 0.3% (Puppy) are smart and break standard, and make something worse if I may add. Filesystem should not be separate category because it lacks application variety, so you will make new category for just 10 or less file managers in Linux (spacefm, thunar, nautilus...), and what is use of category called Personal. Perfect example of let's make something different just to be different, and then application made for Puppy is listed in wrong category Other in all other distributions. No comment. You missed the point. You answered like a politician or like a CEO. Think what you will about me, you will not force me to say that I am happy with a menu system when I am not. Sorry. I easily get lost in the menus you recommend, as probably thousands of other people. Even with its faults, the Puppy menu system is more logical and easier to understand than the menu of some of those distros. And it is easier to customize. Yeah, come to think of it, does your universal menu system take into account personal preferences, personal ways of working on a computer leading to greater personal efficiency ? Whether you like it or not, that is human nature too. Does your universal menu system offer customization tools? Probably not, since it would be contrary to the logic of uniformization in this system. As I said, have programmers standardize the *desktop files first, then we'll talk about menus. I leave you to your "dictatorship" system of menus. I always feel lost in Puppy's submenus with its 200 applications, it is not important if Puppy follows standard or not, for example should Firefox be under Internet or Network, when it uses both categories, why is Gnumeric under Business and Abiword is not, is it permitted using Abiword it the business. I think reason for menu reorganize is precisely in too many applications,that come pre installed with Puppy, otherwise they couldn't not fit the screen, so decision is made to increase number of categories instead of making some GUI (control centre) that can be used to launch various setup applications (from screenshot bellow). in the terminal, and see if it's fast enough. lxde-applications.menu probably can be replaced with what Puppy uses. Is it possible to have a mini alphaOS ..with only puppysave?? Kurttt, you can remove extra.sfs from the iso and have console only minimal system that is bellow 50MB and has pacman, but you would need to install Xorg, some window manager and set everything from the ground up. Maybe it's better idea to extract additional module extra.sfs, then add, remove or change things to your liking and compress it again. But with the minimal system...how can i save puppy 2fs? ?What should I install? ?